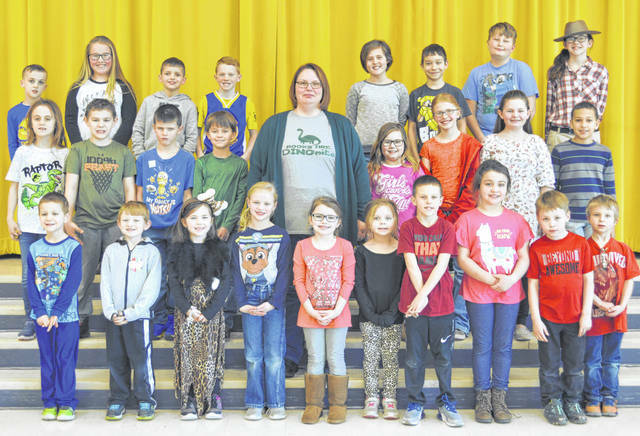 The following children were chosen as Lynchburg-Clay Elementary March Students of the Month. The students were chosen by their teacher for displaying positive behavior, being responsible and respectful, doing good deeds as well as their school work, and being a positive role model for others. Pictured are (front row, l-r) Mathew Perkins (pre-K), Richie Doss (kindergarten), Hadley Partin (kindergarten), Natalie Bohrer (kindergarten), Ally Carraher (kindergarten), Kaylee Hurley (first), Brantley Blanton (first), Hadley Simmons (first), Brayden Weatherspoon (first) and Ryan Peters (first); (second row, l-r) Carlee Schoultheis (second), Carson Fenner (second), Houston McPherson (second), Xaiden Ward (second) Principal Mrs. Godby, Rhealyn Morris (third), Savannah Tong (third), Libby Watson (third) and Tavion Huguely (third); (third row, l-r) Bryson Pfeiffer (fourth), Ashlynn Wilson (fourth), Carson Pfiester (fourth), Alexander VanFleet (fourth), Miley Henderson (fifth), Ryan Rementer (fifth), Keegan Knoechel (fifth) and Matalyn Magee (fifth). Not pictured were Braxton Myers (pre-K) and Kylee Tong (second).